pallets mould usually have four kinds of molded way to make: injection molded,Extrusion,blowing and Blister.Here are we will introduce the way of injection molded pallets mould. Use injection molded way to manufacture pallets could make molded pallets surface flat, clean,strength, meanwhile more higher freedom on design part. Classified by appearance,plastic pallets mould divide into double side pallets mould and single side pallet mould. This two type of plastic molded pallets mould also have different shape, like four window pallets mould, three runner pallet mould, foldable pallets mould,steel reinforced pallets mold,nine-foot pallets molding for injection molding machine. For the instructions, there have racking pallets moulds,ground circumference transformation pallets mould,plastic stacking pallets mold, heavy duty pallet molds. Double side pallets make as whole part but separate to two parts. Whole double side pallets’s weight usually will over 15kg, the shape complex then separate pallets moulds,injection moulding machine demands over 2500T. Whole parts pallets mould are more complex，invest and cost higher.But manufacturer step are less, pallets product products are good quality,effectiveness of production are higher. Double side separate pallets mould,its need separate double side pallet into two upper and down two pieces. 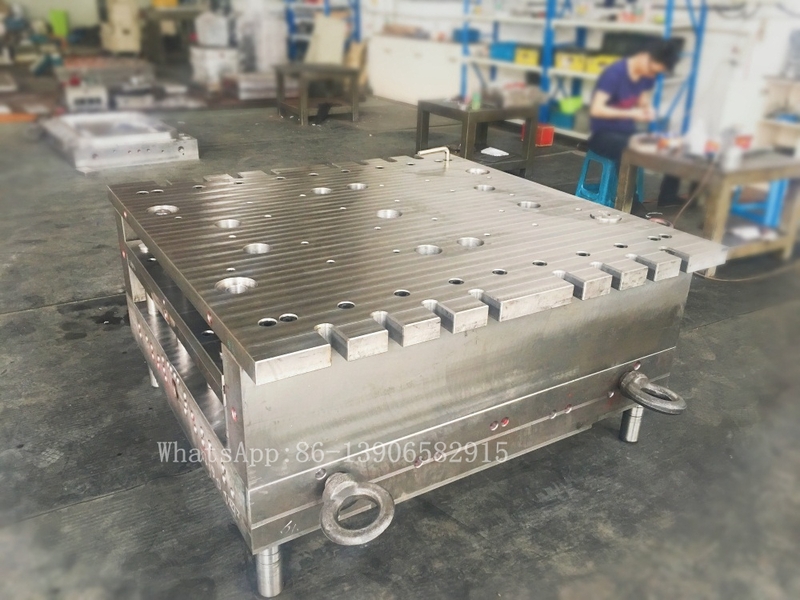 Injection pallets with two moulds, get two parts, then combine them together,usually use welding way to put them together. This way need to make two injection pallets moulds,but the mould structure are more simple. Pallets mould projects invest could be save, meanwhile the demands for injection molidng machine is lower.only need ≥ 1500T clamping injection molding machine.This way is suitable for the molding factory who didn’t have too big injection molding machine. ZL mould is the one the professional pallets mould factory from China.We own high quality, high standard design theory plastic molded pallets mould designer team.Our design team could supply you best mould solution for different kinds of pallets moulds. We have a group with 30 people for management and quality control of injection pallet moulds projects.From 3D drawing for pallet moulds to final mould trial, we are strict for pallet mould analysis and quality control.We just finish new double side pallet mould Last Month. When we get new order for pallets mould projects, meeting will be hold with every department to analysis disadvantage and easy mistake point when doing machining process.Such as strength, material injection,ejector angle,deformation, weld line,thickness and so on.After discuss,the more important is for making mold flow to pallets mould,mold flow give us the real data for how to put the runner point and how much point of runner are more suitable for molded plastic pallets mold. Report will be supply to customer with our suggestion. After mould design confirmed, we will use high-quality testing equipment to check the sample steel material, to ensure that the steel didn’t have cracks or inputrities. Moreover,hardness tester could make sure the steel hardness is qualified or not. Machining process separate for 3 big steps.rough machining, high speed cnc machining and detail machining. And we always keep doing the control for the steel deformation through the machining process. Quality inspector and projects manager will be careful for the pallet mouls assemble.Also trial team will be order the plastic material though customers demands.Pallets mould trial videos, parameter data will be keep and supply to customer.After T1. samples will be send to customer for confirm.We also will supply the report what we think is not good point for customer.After discuss with customer, we will modification the mould. ZL mould establish on Year 2008,Located in Taizhou area.As a new mould factory,we are specialized in making different kinds of injection mould. Taizhou have so many mould supplier, we can be one of the best because we have professional CAD & CAM technical people and within decades of mould experience.Combined with high-precision CNC machine tools, we can provide customers with product development, mold manufacturing, injection molding, die-casting and other services.Paying attention to the creation of every mould production line, we do our best to supply highest quality service for every customer.Welcome to contact us.